At Mortech we’re constantly working to provide you with the best possible tools to help you streamline your business, nurture your borrowers, and close more loans quickly. With so many options and tools available to you, it can feel overwhelming at times to try and utilize everything, or even to understand how certain Marksman tools can streamline your operations. 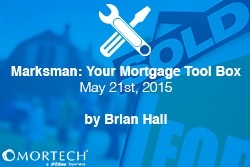 So we wanted to highlight some products you could be using, and show you how they can help boost your mortgage lending workflow. Need a quick monthly payment estimate? Our easy-to-use PTI Calculator can help. Once the scenario is entered and the rates are run, the principle and interest will automatically calculate based on the highlighted rate and loan scenario details. The calculator also automatically calculates if the LTV entered is greater than 80%. Estimates can also be added for taxes and insurance, which will then update the total monthly payment, which will be reflected in the shown monthly payment. This calculator is a fast and easy way for loan officers to give their borrowers a good idea of what their monthly payment is going to be based on the rate that they’re quoting. Marksman’s RateTracker tool allows a loan officer to keep a watchful eye on the market for a specific rate based on the saved loan scenario in the borrower’s file. Setting up the tracker is easy; about halfway down the page of the saved Marksman file is a tab titled RateTracker. By clicking on “inactive” under “Modify RateTracker”, you simply fill in the minimum threshold, which determines how long you want the tracker to run, and you can then set how you would like to be notified if Marksman finds that rate. The RateTracker is a fantastic tool to help keep borrowers looking to refinance informed about when certain rates drop enough for it to make enough financial sense. Within Marksman, you can also setup default scenarios to save you time when running different rates. For example, if you only want to view government products, you can simply create a government scenario that allows you to filter down to only those products. You can even lower the FICO score as well as raise the default LTV. This can save you time when you simply want a quick quote, but don’t want to have to filter through each and every product available. Anytime a Marksman user enters an LTV that is greater than 80%, the mortgage pricing engine automatically calculates PMI. That means you can simply choose from a list of MI companies in the configuration based on which companies your bank typically works with. Marksman will always choose the best ex calculation based on the scenario entered by the user. Once they’ve received the rates, they can then view the MI quote and estimated monthly payment amount in the “Base Info” tab. Marksman also allows users to choose lender paid mortgage insurance when available, depending on which lenders are pricing. This makes pricing faster and easier, and allows you to focus on more important things, like bringing in more leads, and keeping your borrowers happy and more informed. All of these tools are just some of the ways we’re helping Marksman users bring in more leads, push out rates faster and more accurately, and ultimately creating the best experience for their borrowers. To learn more about these different tools and how you can utilize them, you can schedule a session with someone from our excellent training team. Or if you’re not yet a Marksman user, you can schedule a free demo today and find out what you’re missing.